We have two birthday parties for little girls tomorrow, so tonight I whipped up some headbands for last-minute (as usual🙄) gifts. The insect one is my favorite! A few weeks ago (?) I started sewing a Japanese knot bag out of some cute fabric a friend gave me. I couldn’t get far at that time, due to kids and confusion with the pattern. But today I finished it! I meant for it to be a project bag, but as soon as it was done, I was heading to the library and stuck my wallet, phone, and keys inside, instead of taking my big (and unnecessary) backpack. It was perfect! 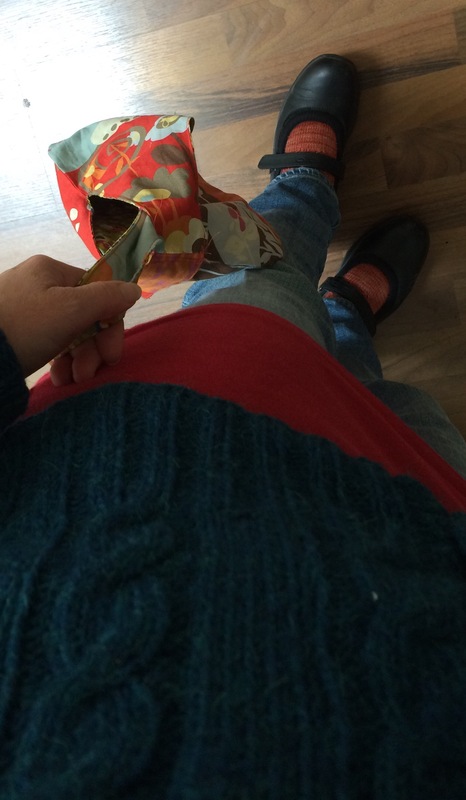 Here’s an awkward selfie to document the simultaneous use of handknit sweater, handknit socks, and handmade bag. Also! 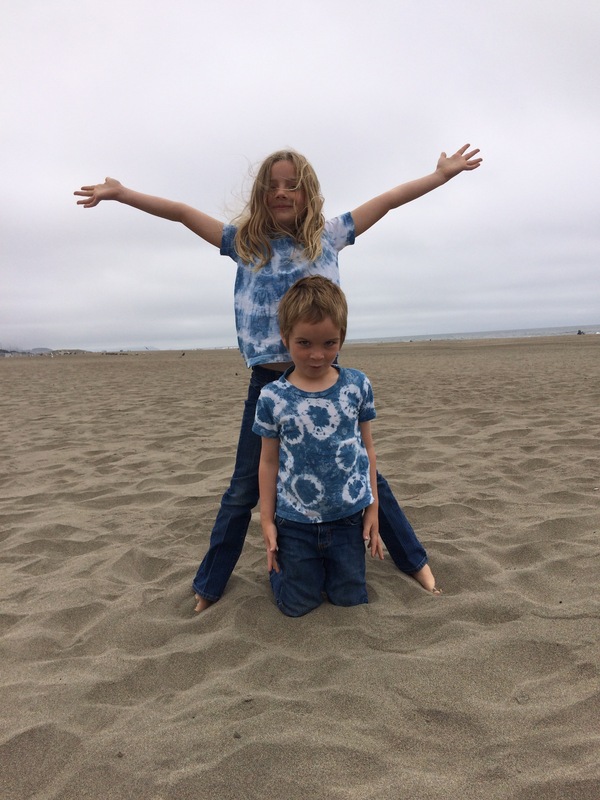 Yesterday we went to the beach and the kids decided to wear their recently tie dyed shirts, so here they are in action. And! 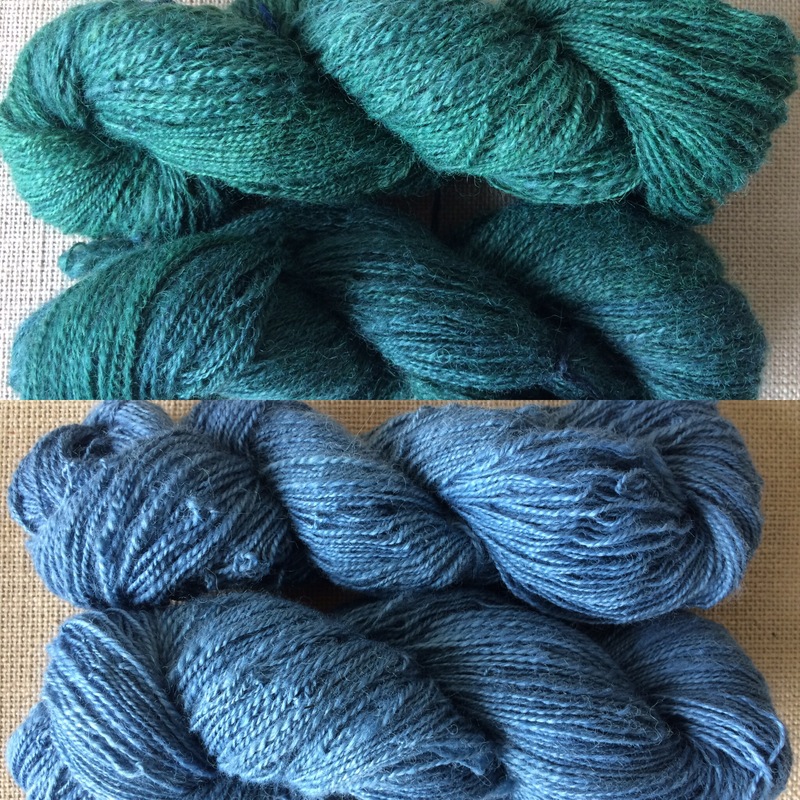 My indigo-dyed yarn is finally dry- here’s what they look like. 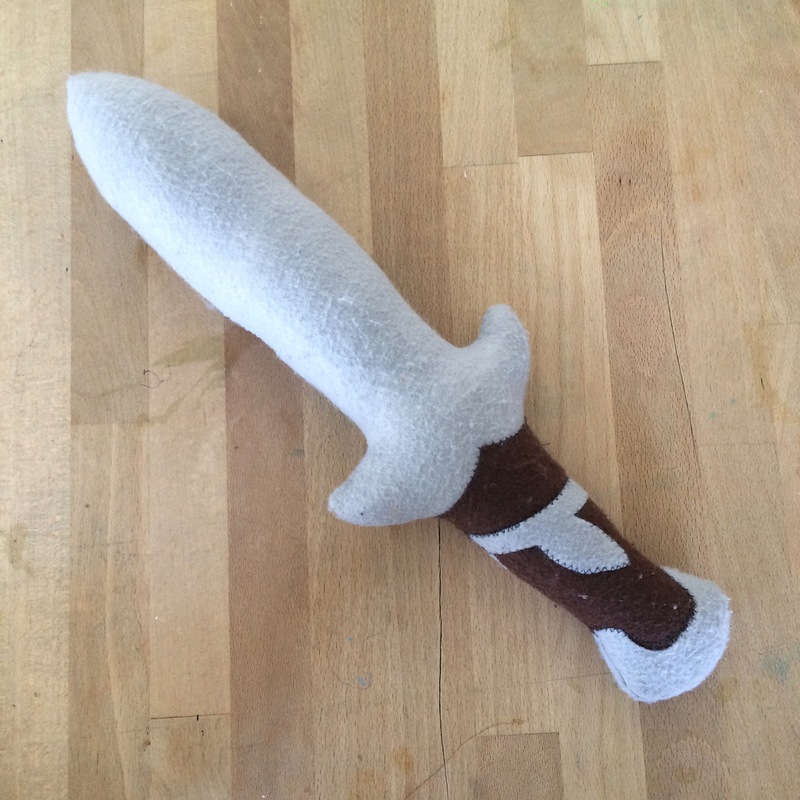 Yesterday I sewed up a little sword for the Wee Boy. This is Sting, Bilbo Baggins’ sword which he eventually gave to Frodo. I overdid it last week, knitting too much. My hand hurtsa bit so I’m knitting very little. 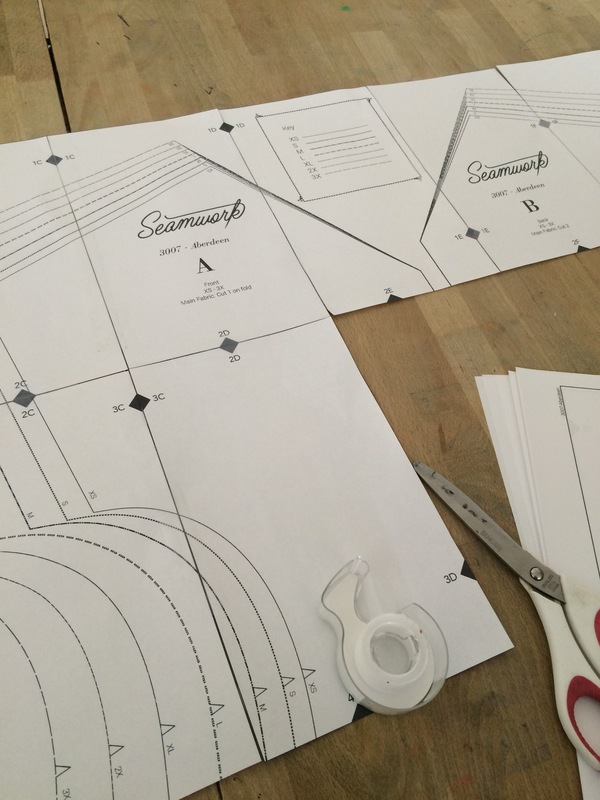 Instead, I’ve started prep to sew a new garment, Aberdeen from Colette/Seamwork. cut, cut, tape, tape, cut some more. The pieces are all cut out. 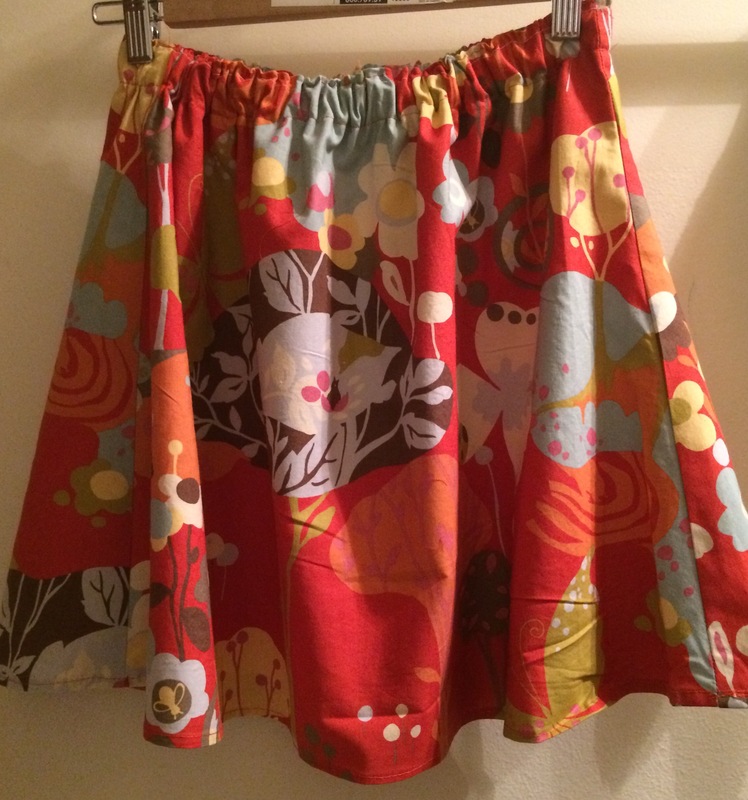 Today I shopped for linings for a few skirts I’ve been wanting to sew. From our trip to the Lost Coast, I have some purple flowery souvenir fabric from the shop Stitch in Ferndale, and I also have some cool “wonderland” fabric recently destashed to me by a knitting friend. The pattern is the Robert Kauffman free skirt pattern, but I thought I’d try making it less wide this time, as I’m pretty petite and don’t need tons of fabric bunched up around my waist. 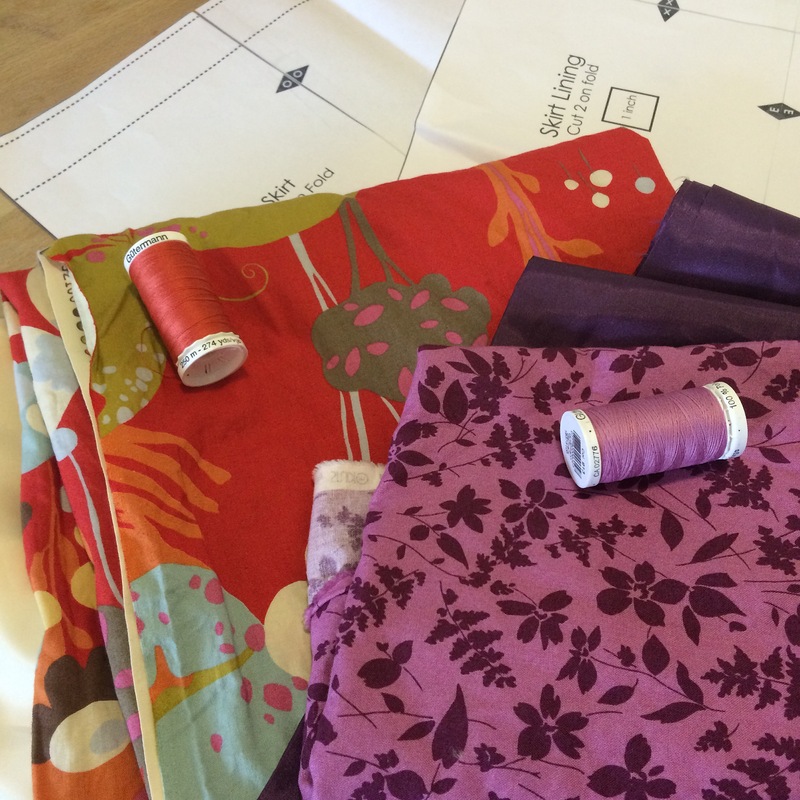 I started with the wonderland fabric, because I have a lot of it. It came out perfect for me. The length is just as I like my skirts- it hits above the knee. The circumference is not as generous as the Tardis skirt ended up, and I think this less fluffy/bunchy effect looks better on me. Plus, you can see the cute print more easily. I am so happy with the pattern placement! I’m sure I will omit the 4 inches or so that I took off from the circumference every time I make this pattern in the future. The only thing I regret is that I forgot to add the pockets I had prepared. I love skirts with pockets! Oh! By the way, I forgot to show you my souvenirs from the lost Coast. 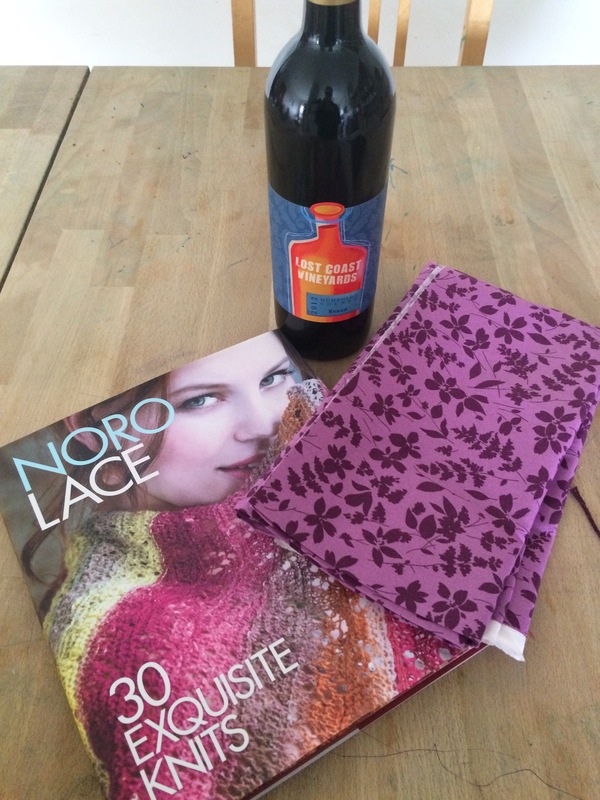 Knitting book, fabric, and wine. Pretty perfect! Ok, readers, I’m back! My carpal tunnel has gotten loads better, due to rest, acupuncture, and very helpful Occupational Therapy with exercises/stretches/massage as homework. Since I last wrote two months ago (! ), I’ve managed to make lots of things, so this will be something of a photo dump. I hope you don’t mind! 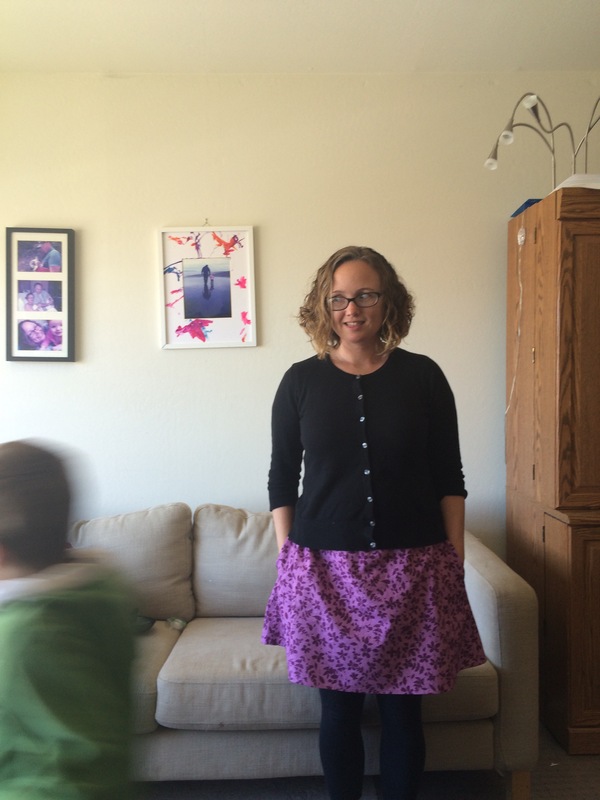 In sewing news: I made myself a Tardis skirt! 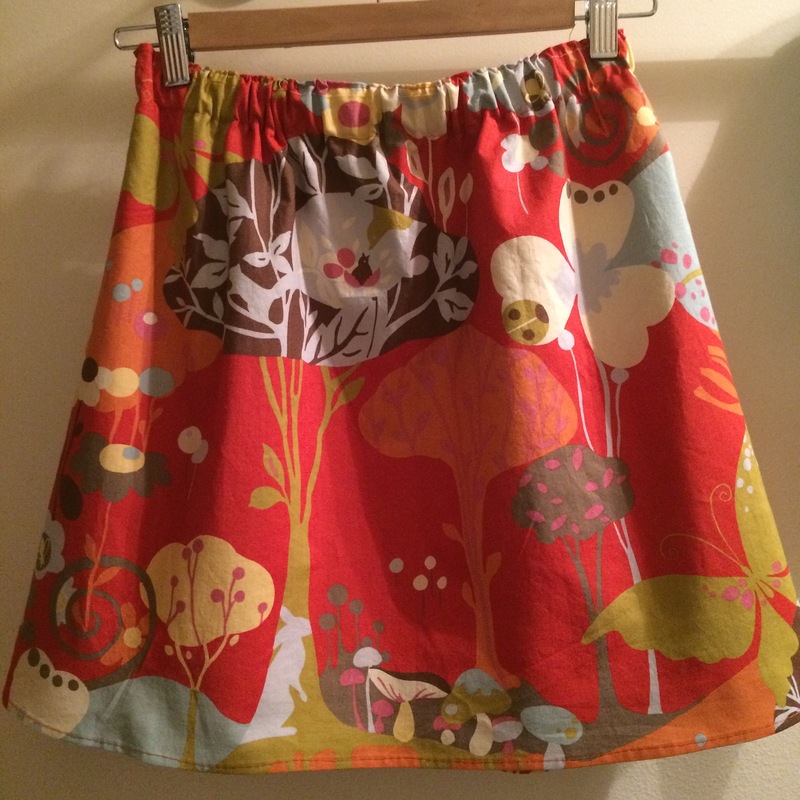 It’s this simple lined skirt by Robert Kauffman: http://www.robertkaufman.com/quilting/quilts_patterns/simple_skirt/ It’s great! 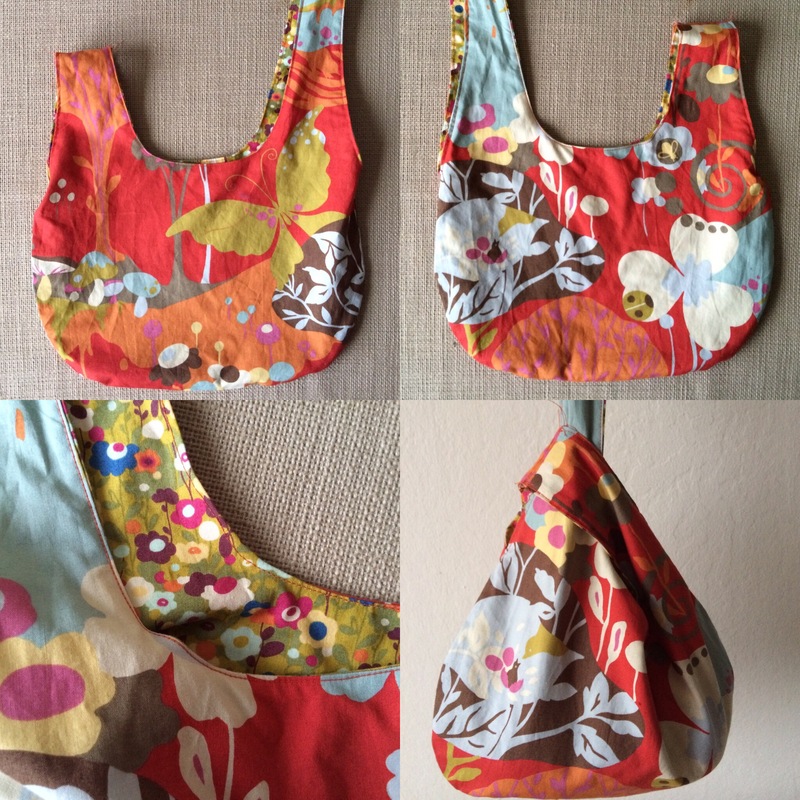 Easy, quick, free pattern! I’ll totally make it again, but with pockets next time. 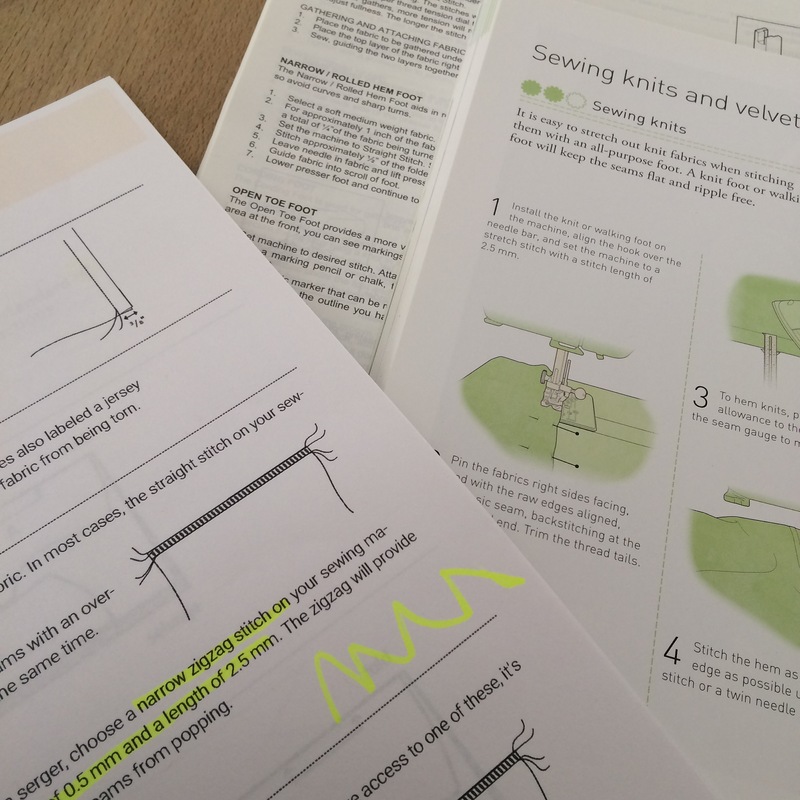 Baby sewing! I made these rompers for my great niece (the awesomely chubby thighed baby) and for my cousin’s granddaughter, whose daddy is a big Batman fan, and I happened to have the right amount of Batman fabric for a romper and a reversible bib! In knitting news, I’ve made two hats for the Leethalknits mystery hat club. These are Vanguard and Omnia. http://www.ravelry.com/patterns/library/vanguard http://www.ravelry.com/patterns/library/omnia The special increases on Omnia hurt my hands, so I switched to regular old kfb, and it was much better. 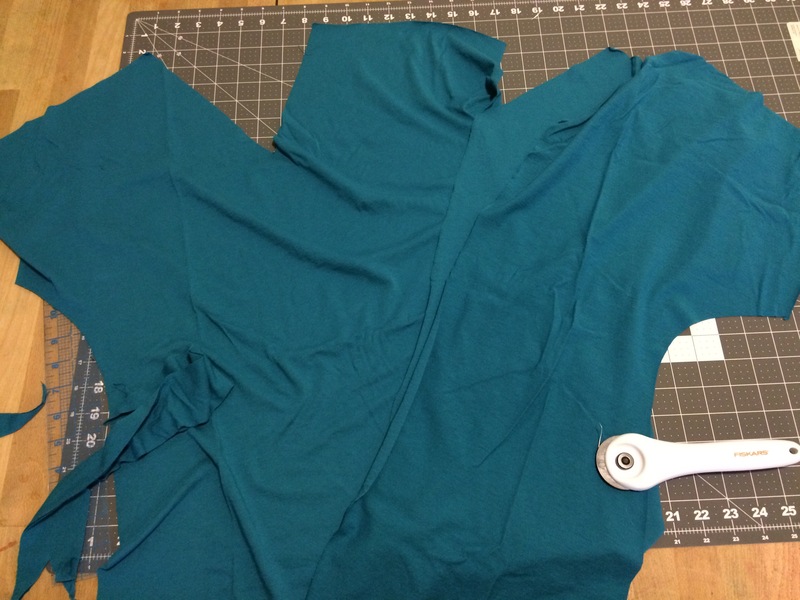 I also like the ridge that kfb made, as opposed to the sloppy eyelets I was getting with the center double increases. In bear knitting news, I’ve finished several new bears. Last night I finished one more, which I haven’t been photographed yet. I’ve finished up to the letter R (Rugen)and have started S (Saruman). And I’ve had several bear sightings in Africa! I might be missing a few since I haven’t been keeping up on here, but here are a few! Kylo, Henrietta, Buttercup, and Gandalf. You might notice that most are from my current journey through the alphabet, where I’m naming them for characters from my favorite movies, so I have to get more sent out! I sent a box to Minneapolis last week, so I’m doing well with these. It helps that the stockinette doesn’t irritate my hands/wrists. I’ve also swatched for a new top, but haven’t started it yet due to a trip and my fallback knitting of bears. This is a Berroco booklet I found at Imagiknit after falling in love with the knitted sample on display. And of course, we’ve had lots of local adventures, mostly centered around getting the kids out in the trees. We’ve played at Stow Lake, in the Presidio, many parks and playgrounds, the Exploratorium, and we’ve done lots of swimming at the pool…. Yesterday the kids and I came back from 3.5 days on the Lost Coast, which was gorgeous (all the pics below except the line of children at the SF Botanical Gardens). Yep, we’ve been having some pretty good summer adventures. Mostly our days are unstructured, aside from Thursdays and Saturdays, when the Girl has been playing baseball with the Junior Giants. Yay, summer! And yay for being recovered enough from Carpal Tunnel to be able to craft and blog again. It’s nice to be back!